I’m currently between apartments and can’t unfold the tent or unpack the lightbulbs comfortably. 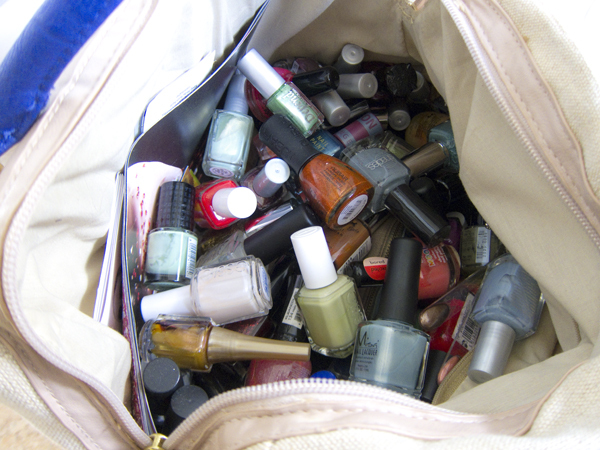 Also, I’m using this bag of polishes as a pillow. Mjeh, no, it’s not that bad. This bag of polish and the other four will be back in my Helmers soon, and blogging will be back to normal. In the mean time I’m spending my usual swatch hours playing Risk with my cousins and trying to behave myself. Who knows – maybe I’ll win some day? In our family winning isn’t the thing with playing Risk it’s who has Alberta that is the most important thing. Don’t ask why it’s just one of those crazy things that we decided on a long time ago that was the part that everybody is fiting over! Bahaha that’s funny! We basically all fight to defeat the one cousin who always wins.. grr..